Stump grinding is the most desirable way of removing a stump from your property. Even though there are different methods that can be used to speed up the decomposition of the stump in order to remove it, these methods are not as environmental friendly or fast as simply grinding a stump. Not to mention the stump removers are not so easy to find or straightforward to administer, for the right results. Instead, opting for the grinding method to remove the unwanted stumps from your backyard or property, will save you time and worries. Plus, using this option, the stumps can be grounded deep enough below the current ground levels to have any other plants seeded on top of it, or just enough to grow lawn over it, completely hiding where your stump used to be. This method is also entirely eco-friendly. Grinding a stump can also be dangerous though if you don’t have the knowledge or experience to carry out the job properly. You also need the know how to make use of the equipment, that in case you have the right equipment. The best option is to hire specialists that offer stump grinding services, who will safely and time-effectively remove all the stumps or roots from your property. At Tree King Tree Services we offer stump grinding and root removal services, which are carried out with a stump grinding machine that will cut through any stump, from small fruit tree stumps, to larger stumps. We can remove stumps established anywhere on your property, even in the most difficult or isolated locations. The cost of this service depends on access size and how far down you need the stump to go. In some cases stumps only need to go below ground level but in other cases stumps have to be taken right out in order to either plant a new tree in its place, extend your property or to lay foundations. 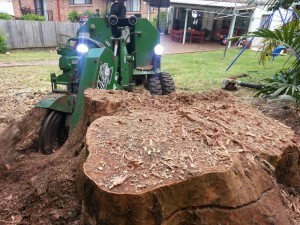 Call us on 04 04 04 33 33 to schedule a site visit for a free quote on your stump grinding.